LINK chains used for lifting,fabrication and other kind of purposes.Also used in marines for ship and in chemical industries. 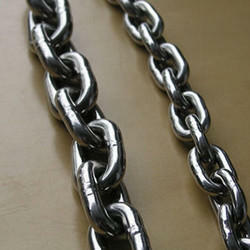 S.S link chain manufactured from 3mm to 100mm Rod dia in any grade of SS like S.S 202,304,316 etc. With polish or nickel plated having mirror finishing. free from rust and all.